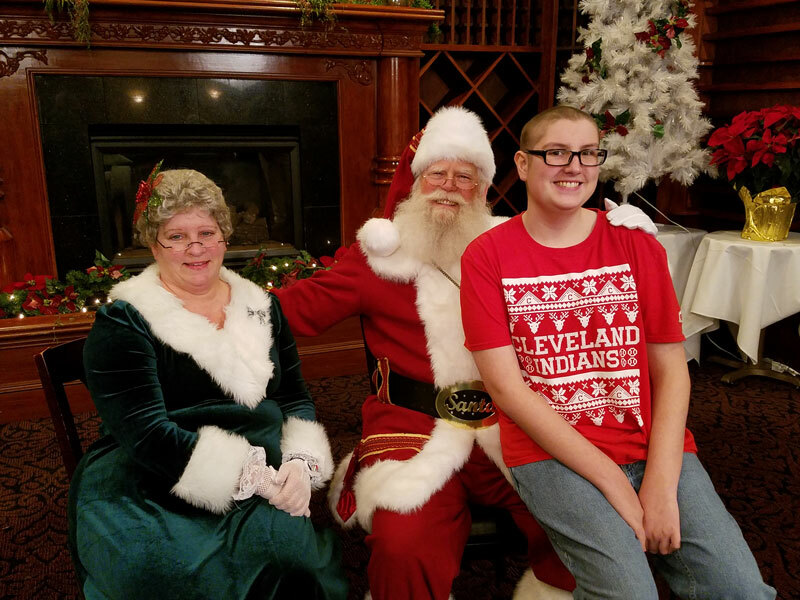 Logan Boylen has always loved Christmas and his parents kept that holiday spirit alive throughout his battle with acute lymphoblastic leukemia, including photos with Mr. and Mrs. Claus. The holidays are usually a time spent celebrating with friends and family, but for Carl and Leslie Boylen the holidays took on an entirely new meaning when their son Logan was diagnosed with acute lymphoblastic leukemia. At the time of his diagnosis in 2016 Logan was 10 days away from his 14th birthday and about to start his freshman year of high school. It was a “stomach punching blow,” Leslie said. “Instead of starting marching band practice, we had to break the news to his friends,” she said. Logan immediately started undergoing treatment and it was a long road. It took three attempts to put him into remission and he was unable to leave the hospital between treatments because “everything that could happen, did happen,” Leslie said. Their supposed-to-be 14-day stay turned into a 92-day stay. As the holiday season approached, Leslie and Carl knew they had to do something to help their son, who is, as Leslie says, a “total Christmas nut,” celebrate his favorite holiday in spite of the circumstances. Leslie also put an ask out on her Facebook page to see if her friends and family could send Logan a Christmas card because he’d always loved receiving those. She had no idea what that simple request would turn into. 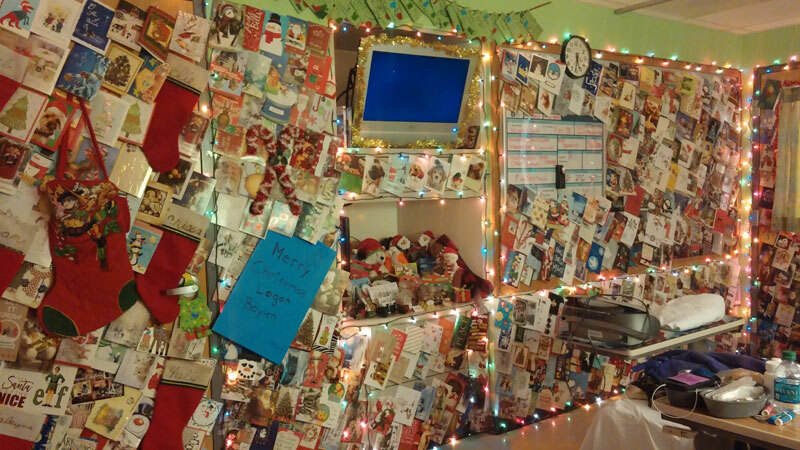 These are just a few of the 5,000 Christmas cards Logan received when he spent Christmas 2016 at Akron Children’s Hospital. Another holiday tradition for the Boylen family that took on new meaning after Logan’s battle with cancer is the Holiday Tree Festival. Leslie moved to Ohio with her family in 1985 and went to the event every year after that. She then continued that tradition when she started her own family and Logan grew up attending the Holiday Tree Festival each year. 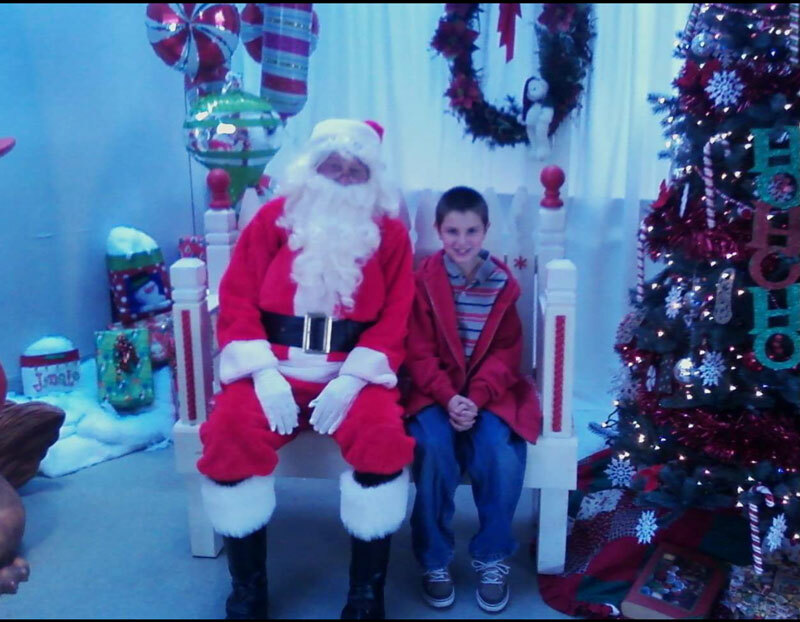 Logan went to the Holiday Tree Festival every year growing up and is pictured here with Santa in 2010, 6 years before his cancer diagnosis. Leslie even suggested to the Teens Against Cancer group from Barberton High School, where Logan is now in his junior year, that they decorate and donate a tree for the Holiday Tree Festival. This will be the group’s third year doing so. You can visit the 37th annual Holiday Tree Festival and see the hundreds of trees, wreaths and holiday gifts decorated for the season from Nov. 17-25 at the John S. Knight Center. This event is presented by the Volunteers of Akron Children’s Hospital and is free to attend. For more information and for the event’s hours, visit akronchildrens.org/treefestival.